This is a meme hosted by BethFishReads found here. My post this week is not on one specific meal or recipe but rather on…. an unfortunately neglected root vegetable in the US where I currently reside. Maybe it’s his looks?? In real life, I don’t know anyone who eats them. In the UK, he would be called a swede, which is short for Swedish turnip. In some areas, he might just be referred to as a turnip, yellow turnip or neep. In the US, however his name is rutabaga, this is derived from the original Swedish word Rotabagge. The vegetable was first noted growing wild in Sweden. In any case, delicious, hearty, healthy and earthy are all appropriate taglines. Nutritionally, Swede is a fantastic source of potassium. People who get leg cramps at night (charley horses) are often told they lack potassium and should eat bananas. Well 1 medium swede has a banana beat by a mile as a source for potassium. A banana provides 422 mg of potassium, while the lowly swede comes in at 1,177 or 33% of your daily recommended allowance. Vitamin C?? The banana comes in at 17%, while the swede….160%! In addition, our swede has no fat, no cholesterol, and includes some protein, B-6, Iron, Calcium and Magnesium. First, use cleaver (probably any heavy duty kitchen knife would do) to cut swede into quarters, then use your sharp peeler and it works just fine. I guess if for some reason you wanted just the wax off and to leave the skin on the Swede you could try one of the other methods available on line. As far as cooking, my standby is simply to cut the swede into chunks. Then, toss with olive oil, coarse salt and pepper and roast in a hot oven for about 40 minutes, shaking the tray a couple times. Alternatively, I have been known to throw some chunks into a pot of boiling water with potatoes and mash them up together with butter, milk, salt and pepper. My family’s favorite is to use Swede and other of his root vegetable friends in a root vegetable gratin. 1 cup vegetable broth or chicken or whatever you like. chunk of parmesan cheese or about a 3/4 cup shredded. When they are all layered in the pan pour in the broth, put pats of butter on top and cover with foil. bake for about 30 minutes. 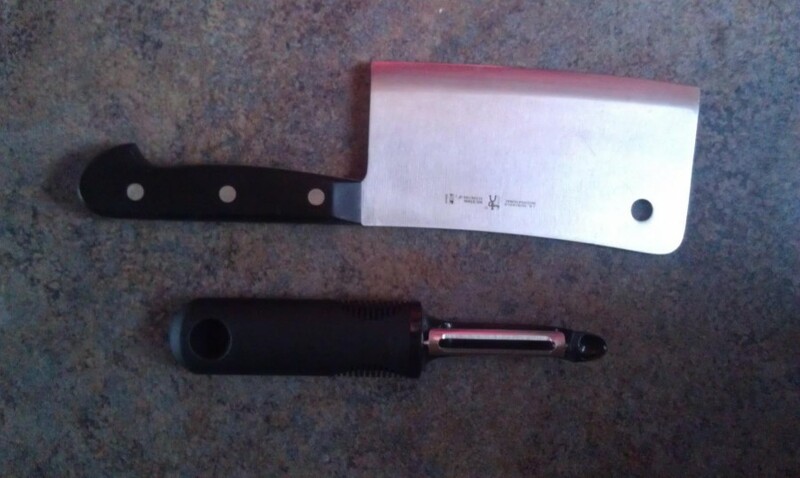 veg should let you slide a knife in pretty easily. Put back in oven for about 20 minutes. I know my unexactness (is that even a word??) bugs some people (read…my daughter) but I generally just eyeball things. Exact recipes are all over the web and can vary greatly in the proportions so try a couple. Here are a couple hints: if you use a bigger pan then your veg layers will be spread out and thinner, you will have to adjust cooking time, also if you use a smaller pan you layers will be deeper, watch your liquid and adjust your cooking time. When you pour the broth in it should NOT be covering the veg, just covering the bottom of the dish. This entry was posted in Cooking and tagged cooking, meme. Eyeballing is the best way to cook, in my opinion. 🙂 It’s what I do too. 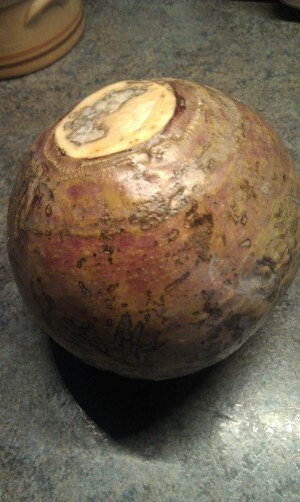 I have never had rutabaga but I do like turnips so perhaps I would enjoy this. Sounds great made into a gratin. I love them but I know some people find the strong flavoured by using them in a gratin with other root veg, the flavor is mellowed. I bought a bag of mixed veggies for stew at the farmer’s market this fall. I made beef stew and I have to say the rutabaga was my favorite one out of the mix that included parsnips and even purple carrots. Yes! They are great in stew. I will say that I do love parsnips, too. I am a big root vegetable fan. Interesting post. Thanks for the intro to rutabaga (like how you refer to it as “he”). 🙂 I like root veggies too, and have roasted parsnips before so maybe I should try these next. I love roasted parsnips as well. Actually I roast a lot of root veg, especially in the winter when having the oven on heats the house up nicely. I’ve thrown rutabaga in with other root vegetables for a winter veggie roast. I didn’t know they were a good source of potassium. That makes them more attractive. When I put a day’s menu in one of those nutrition calculators, I always end up low in potassium. Looks like I need to roast a Swede. Oh wait, that didn’t come out right. So you can treat a turnip like a potato it seems? I dont think I have ever eaten one but it seems I should give it a try. You can mash them with potatoes if you like. They are a firmer than potatoes so you will need to cut the chunks of swede smaller than the pieces of potato, if you boil them all together. Otherwise, they won’t be done at the same time. I’ll have to give this a try. I don’t think I’ve ever tried one. I think they are very region or country specific. They just don’t seem to be that popular in the US. I mainly buy mine at Wegmans or Whole Foods. I will have to remember this given my foot cramping. Good luck – other potassium containing foods are parsnips, sweet potatoes, yogurt and white beans. I love rutabagas! And I also wonder why more people don’t eat them. We usually roast them or mash them. But I throw them into soups and stews instead of potatoes. Ymmm. I didn’t know they had so much potassium. I also put them in soups and stews usually I take however much potato the stew calls for and make it half potato and half swede.